Note: This product is xiaomi ecological chain brand product, there is no any xiaomi marks on the products, please note it. 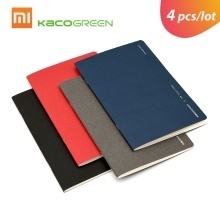 4 pieces/lot, slim and portable, best for office and school. 128 x 210mm, 32 sheets each notebook, optimized 80g paper, 180 degree flatting supported. Ergonomic design, smooth writing, let you love writing feeling. Beautiful and exquisite appearance, a good artwork on your hand. Elegant textured cover with rounded paper corner, recording your good mood. 2. The other items on the picture are not included.